This entry makes use of Japanese characters and will require Japanese language support to be installed on your computer in order to avoid the characters being replaced by question marks, or blanked out. A torii is a traditional Japanese gate most frequently found at the entrance of or within a Shinto shrine. Shinto（神道）, also known as 神の道（kami no michi）or the way of the gods, is an ancient polytheistic and animistic religion indigenous to Japan. Shinto has played a large role in shaping of Japanese culture and identity. Shinto, unlike Buddhism or Christianity, has no known founder or any written scriptures. It was not until the late prehistoric Yayoi culture (ca. 300BC - 300AD) that features emerged that are reminiscent of some of the religion's central aspects (for example, the kami). Archaic Shinto seems to have evolved by the beginning of the final phase of Japanese prehistory, the 古墳 (Kofun, or Tumulus) era (ca. 300-550AD). This belief system was locally based, focusing on the spiritual power inherent in nearby topographical features and on the divine ancestors of clans and lineages. As the Yamato (Sun) clan gained influence over the others, its divine ancestor, the sun goddess Amaterasu-o-Mikami (天照大御神) rose to prominence. The Imperial Family of Japan in ancient times claimed familial relationship to the sun goddess. Polls show that the religion with the most followers in Japan is Shinto, followed by Buddhism and then Christianity. It should be noted, however, that many Japanese do not consider these religions to be mutually exclusive and often practice a combination of two or all three, such that a majority of the Japanese population practices both Shintoism and Buddhism. Funerals most often held according to the Buddhist tradition with births and marriages being celebrated according to the Shinto tradition, but depending on the individual's beliefs and heritage, these may be reversed. Some Japanese may even go through these ceremonies multiple times in each religion (for example, getting married once in a Christian church and then a traditional Shinto or Buddhist ceremony). Shinto as a religion focuses around the worship and veneration of deities known as Kami (神). The word refers to divinity, or spiritual power, and is used to mean "god" or "spirit." It is believe that every natural thing, from the river to the wood that builds a house has a kami. Through veneration and tradition, a healthy respect for the natural world is cultivated among the observers. In 1871 Shinto was established as a state religion (during the Meiji Restoration), and was used as a mechanism for fostering nationalism and loyalty to the emperor. This time period is when the name "Shinto" was first used to describe the religion. "State Shinto" came to an abrupt end with the defeat of Japan in the Second World War in 1945. The emperor (whose worship was used as war propaganda) renounced all claims to divinity, and Japan's post-war constitution of 1947 (which Americans played a role in writing) prohibited the state from having any involvement in religious affairs, thus allowing for freedom of religion. The sacred space of Shinto are called jinja (神社, or Shrines). Thousands of small shrines exist across Japan, many sharing ground with Buddhist Monasteries, especially in Kyoto and Tokyo. 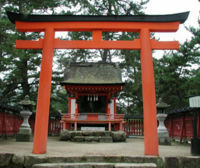 The entry way into a Shinto shrine is always marked by a Torii (gate), which symbolizes the border between normal life and the divine; the spiritual world as separated from the rest. In Shinto mythology, there are many different deities, and kami (spirits), one of the most famous Shinto deities is, Amaterasu, who the Japanese Royal Family used to claim descent from. Amaterasu is the sun goddess in Shinto. The most famous story about Amaterasu tells of her retreat to a cave when her brother, Susano'o, the storm god ravaged the earth with storms. Without the sun goddess, crops began to die and demons roamed the earth. To lure her out of the cave, another goddess performed a dance outside the cave. Hearing the laughter of the gods, Amaterasu peeked out of the cave and saw herself in a mirror hung on a tree. Awed by her own beauty and brightness, she ventured farther out of the cave, where the other gods caught her and pulled her out. The story is reminiscent of the Greek legend of the abduction of Persephone by the god of the underworld, Hades. As her mother Demeter, the goddess of the Earth, roamed in search of her daughter, crops withered in the fields and people suffered terribly. Hachiman is the Shinto god of war, and the divine protector of the Japanese people. He is worshipped by the peasants as the god of agriculture, and by the fishermen who hope he will fill their nets. Hotei is the god of happiness and laughter and the wisdom of being content in Shinto Mythology. Izanagi is according to Shinto Mythology, the primordial sky, the god of all that is light and heavenly. Izanagi ("the male who invites") and his wife and sister Izanami ("the female who invites") are believed to have been given the task of creating the world. Standing on Ama-no-ukihashi (the floating bridge of the heavens), they are said to have plunged a jewel crested spear into the ocean. When they pulled it free, the water that dripped from the spear coagulated and formed the first island of the Japanese archipelago. This page was last modified on 1 March 2017, at 16:16. This page has been accessed 25,423 times.